It has proved generally difficult to develop small molecule receptor antagonists because the surfaces involved typically are large and flat. 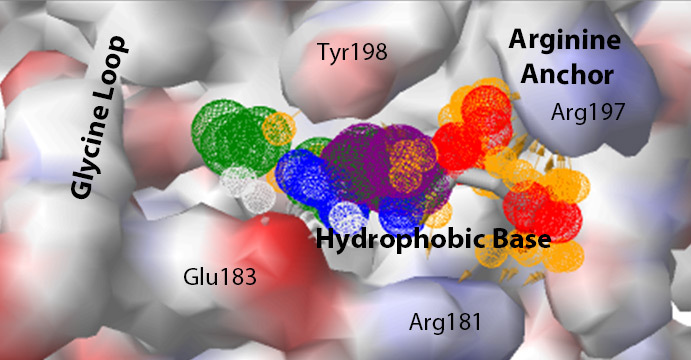 In a new study on NK1, a receptor-binding fragment of the growth and motility factor HGF/SF, several small molecules were found to bind in the lysine-binding pocket of the kringle 1 domain. The binding mode of these molecules was defined by X-ray crystallography, NMR and SPR and proof of concept is offered that the HGF/SF-MET interface may be successfully targeted with small molecules. The studies have broad implications for the development of HGF/SF-MET therapeutics and cancer.